Being in this place feels wrong. I shouldn’t be here. I never did believe in God or Satan or any of that stuff. Neither is it a fear of zombies rising from their graves. No, it’s none of that. It’s more of a feeling I get when I go in graveyards. Usually it’s nothing more than a persistent tingle radiating through me. Sometimes it’s more. That doesn’t stop me though. I still come, but never to the same cemetery twice. You see. I’m searching for something. I have been for a very long time. I need to find my body. Thank you to all of the veterans out there, especially those that may still be wandering around looking for their bodies. I hope you find what you’re looking for. Click here to read stories from the rest of the Fictioneers. The house at the end of Sycamore Street was always a favorite spot of mine when I lived in Stubenville. The place was huge. We called it a mansion, but it wasn’t. It was just a big house. Sycamore dead ended at the house. Despite the creepy vibe the house gave off I never did think the place was actually haunted. Weirdest part of that place was the stop sign–a red eye watching from the trees, covered in pock marks from the rocks we used to chuck at it. John even shot it with his dad’s .22 a few times. 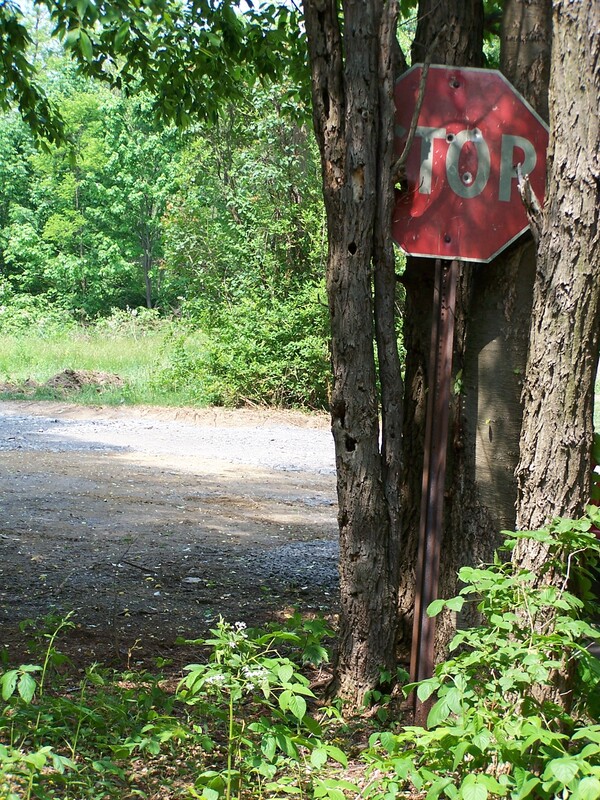 I know you’re probably thinking there isn’t anything weird about a stop sign, but it was at the wrong end of the road. It was ten feet off the porch of the house. Now remember, this was a dead end street. There was no crossroad and no reason for a stop sign to be there. We’d go out there and hunt for ghosts almost every weekend. Never found much of anything–just a few “orb” photos that are probably just dust in the air. Even when we were kids the place was falling apart and chock full of mold. I’d hate to see it now. Hunting ghosts was just something fun to do to pass the time. Besides, it kept me off the drugs most of my friends found their way into. Chris and I were the only two that managed to stay clean. John eventually cleaned up his act. Evan and Kyle have been in and out of rehab too many times to count. Zach wasn’t so lucky. The week after Zach died we went back out to the house–Chris and I that is. We didn’t feel much like searching the house for ghosts, but we went anyway. Zach’s death was hard on us. We didn’t know how to react, so instead of reacting we pretended everything was fine. We did what we always did. We went to the mansion at the end of Sycamore Street. The stop sign glared at us as we approached. To be honest, it freaked me out a little. It never had before that day. It felt like a warning–the hand of God telling us to stay out of that house. Almost immediately upon walking through the door we could tell the house felt different, darker somehow. Chris thought he saw a shadow move so we chased it into the next room. Zach was standing in the middle of the room. Only it wasn’t Zach. He was transparent. The beams of our flashlights went right through him. As if that weren’t terrifying enough, his eyes were black. I’m not ashamed to say I ran. We both did, and we never went back. We haven’t really talked about what we saw, but that image is burned into my brain. Even twenty years later I still see it every time I close my eyes. Only for a fleeting moment, but it’s always there. This story was written for my Storybook Corner prompt. Click the link for the details and add a story of your own.